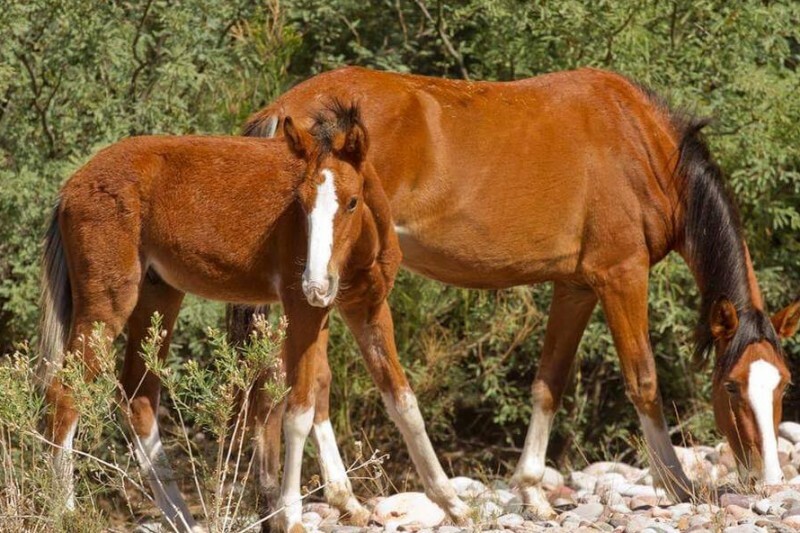 The Salt River Wild Horse Management Group (SRWHMG) and the American Wild Horse Preservation Campaign (AWHPC) are offering a $2,500 reward for information leading to the arrest and conviction of the person or persons who shot three Salt River wild horses in the Tonto National Forest on Friday. At least one horse – a beautiful 6-month foal named Kai – died, and two other young members of the same band have been observed alive, but with a possible small bullet wound. Anyone with information about the shooting should call the Salt River Wild Horse Management Group at 480-868-9301 or the Maricopa County Sheriff’s office at 602-876-1011. On Friday, Oct. 21 at about 6 p.m., a witness saw a man wearing black shorts and a dark green shirt shooting three Salt River wild horses. The suspect was not caught and remains at large. The witness saw one of the horses in the river down in the water thrashing about, and observed two other horses get hit with rounds from a rifle or shotgun. The suspect chased after the horses as they fled. Two other individuals are believed to have been with the person who shot the horses. On Saturday, Oct. 22 the Salt River Wild Horse Management Group found the beautiful Salt River wild foal, born in April 2016, dead with gunshot wounds to the side of his neck and head. The group also located two horses from the same band with a bullet wounds, who are still alive and may need to be rescued by the Salt River Wild Horse Management Group. Donations to the Go Fund Me page will be used to increase the reward fund to ensure that the shooter of these innocent horses is brought to justice, and, if necessary, to rescue the surviving wounded horses or other fatally injured Salt River wild horses. The wounded horses need to be treated. Please use a tranquilizer and treat their bullet wounds. Let's catch these guys! Thank you for the your great work and I hope you prosecute the person responsible for this tragic assault. These evil demonic killers need to be punished with the full extent of the law. This is the cruelest form of animal abuse . They need surveylance cameras and "boots on the ground " security to patrol the area. Hope they locate the wounded ones that were shot and can treat them. It's a crying shame there are such low lives that want to kill these beautiful , noble and iconic horses. In honor of sweet Kai. And thank you SRWHMG for all that you do!